Carole Boston Weatherford is a New York Times best-selling author and poet. Her numerous books for children include the Coretta Scott King Author Award Honor Book Becoming Billie Holiday, illustrated by Floyd Cooper, and the Caldecott Honor Books Moses: When Harriet Tubman Led Her People to Freedom, illustrated by Kadir Nelson, and Voice of Freedom: Fannie Lou Hamer, Spirit of the Civil Rights Movement, illustrated by Ekua Holmes. Carole Boston Weatherford lives in Highpoint, North Carolina. All of the book's details paint Schomburg as an admirable, flawed, likable, passionate man whose lasting legacy, Harlem's Schomburg Center for Research in Black Culture, opens its doors to all who would learn more about the people its founder knew had been left out of the written record. A must-read for a deeper understanding of a well-connected genius who enriched the cultural road map for African-Americans and books about them. Lifelong bibliophile Arturo Schomburg would be pleased by Weatherford’s prose-poem biography, which praises his passion for researching and collecting books, manuscripts, and other written materials relating black heritage and history...As with her previous book Voice of Freedom (2015), Weatherford illuminates a person well worth knowing. A rich book to add to all collections. Through text and art, Weatherford and Velasquez craft a winning portrait of both collector and his collection...Schomburg’s collection was donated to the New York Public Library and now boasts over 10 million items. This excellent work of history illuminates Schomburg and his legendary collection for a new generation—it belongs in all public and school libraries. In graceful free verse, Weatherford delivers a remarkable tribute to Arturo Schomburg...Schomburg’s ambitions, scholarship, and accomplishments were tremendous—“There was no field of human endeavor/ that he did not till with his determined hand”—and Weatherford and Velasquez more than do justice to them. With great respect to the man's riveting life story, Caldecott and Coretta Scott King Honors author Carole Boston Weatherford relates through narrative poetry the story of Afro-Puerto Rican immigrant Arturo Schomburg. 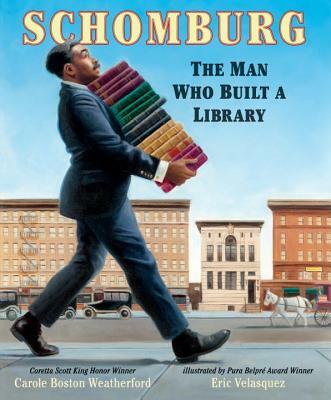 While each poem in Schomburg: The Man Who Built a Library can stand alone as a single snapshot in the literary life of Schomburg, Weatherford's portrayal of the bibliophilic law clerk is so wondrous, readers won't be able to resist turning the pages to learn more. Velasquez’s richly detailed oil paintings aptly capture Schomburg’s zeal for learning and for teaching others...A must-read about a bibliophile extraordinaire. In a series of twenty poems, Weatherford offers readers a biography of the life and work of Arturo Schomburg (1874-1938)...Velasquez’s expressive oil paintings capture the time period beautifully.